This evening’s satellite picture showing scattered strong to severe thunderstorms in progress across the Southern Plains. There has been various reports of damage so far today across portions of the Red River Valley on the Oklahoma side. Right now, we are focusing on this discrete thunderstorm that has developed near Fort Worth, Texas. 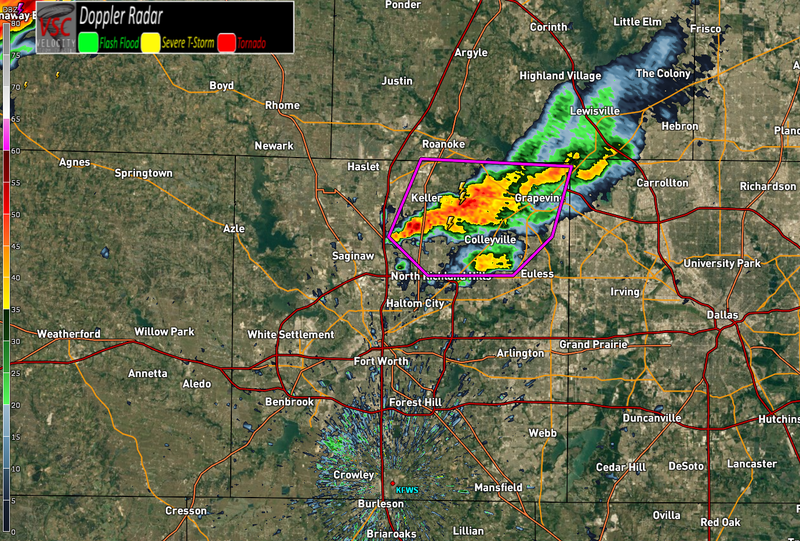 A tornado warning is currently in effect for areas northeast of Fort Worth. A confirmed tornado was reported by weather spotters moving northeast at 40 MPH. The possibility is there for more discrete thunderstorms ahead of the squall line through the remainder of the evening. Along with the severe thunderstorm watch in effect for eastern Kansas and western Missouri, there are these two tornado watches that are in effect. Watch 531 is in effect through 8:00 PM CST. Watch 533 is in effect through 9:00 PM CST. Along with the damaging straight-line wind threat, a couple of intense tornadoes are not out of the question through the remainder of the evening as well. Stay with Weather or Knot for the very latest.